Well, not really. It is actually an Orthodox hymn for August 29th, which is the Feast of the Beheading of St. John the Baptist. However, according to the Old Calendar August 29th lands on the New Calendar September 11th. This makes the hymn all the more interesting, especially when you consider that at the hour Muslim terrorists struck America (Mid-morning), Old Calendar Orthodox were chanting the following hymn. Draw Your bow, march forward and reign, O Son of the Mother of God, subduing the Ishmaelite people that wars against us, granting victories to our Orthodox Sovereign over barbarian enemies, at the prayers of the one who gave You birth, O Word of God. 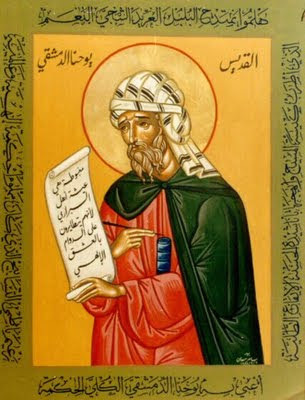 St. John was the first Christian to write against the "new" Islamic heresy in his book Against Heresies. He lived among them and worked for them in the city of Damascus before being tonsured a monk at St. Savas Monastery in Israel. And the Muslims (Ishmaelites, as he called them) were a much greater force and threat than they are now. Draw Thy bow, and prosper and reign, O Son of the Mother of God, subduing the Muslims who wage war against us and granting victory to our Orthodox Hierarchs over all heresies, through the entreaties of Her Who gave birth to Thee, O Word of God.